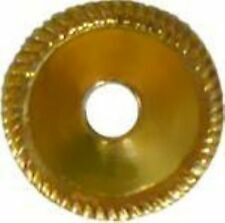 If you find a number of things you are interested in. General Hydroponics Cocomat 4' X 8' X 0.25"
Complete with heavy gauge wire mounting bracket and hard wood shaft with tin carousel holder. Steel and Wood Hoosier Style SPICE RACK CAROUSEL. (i.e. scuffs, scratches, stains, dings, dents, etc.) from normal use over the years but remains structurally rigid & strong, with NO major defects whatsoever. Moderate crazing to all painted decorations. Card Size (each): 15"high x 7-7/8"wide. 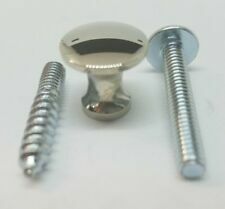 Morris Chair Brackets with slots for four (4) leaning positions. 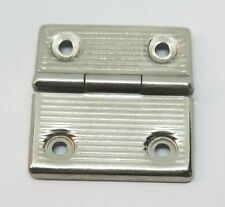 Polished Brass Plated Cast Iron Morris Chair Brackets. Overall: 6-1/2"long (tip to tip) x 3/4"wide. SOLD BY THE PAIR ONLY. The corners of the chest are decorated with primitive chip edge carvings, and the front displays the original demi-lune scribe carvings, above a carved apron. The carvings to the front of the chest indicate that it may possibly have originated from the West Country, possibly Salisbury. The Rustic Gray Large Wooden Storage Trunk is a handcrafted work of art. Its large size provides ample storage space. Antiqued hardware add to the rustic style of the trunk. Antique style large storage trunk. Set of Three Hoosier Style DOOR CARDS. Card Size (1): 15-1/8"high x 8-5/8"wide. I have kept the green color on sides of the trunk, locks. 2 new ropes handle. the trunk is fully refurbished. It makes a quirky coffee table or a blanket box and provides lots of extra storage for your bits and bobs. 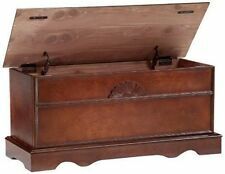 Superbly crafted in wood and faux leather, these chest are truly wonderful work of art. Their beautiful faux leather makes them a real nice addition to your décor while storing and hiding all your unnecessary stuff. Decorative Footed Box with Black Lining, Key & Tassle Design 13 1/4"x9"
Not sure what this is made out of, it's heavy kind of looks like plastic. Couple slight scratches, scuffs, couple small chunks of plastic missing. Beautiful wood box. A storage trunk or chest is simply elegant and nostalgic in any home. There are several different types, but any storage trunk, whether it be a footlocker or trunk, will be a beautiful conversation piece. These pieces of furniture can come in a variety of materials other than wood, such as metal, fabric, and wicker and can be used as tables in addition to storage space. 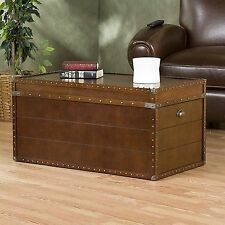 What types of storage trunks and chests are there? Hope chest: A hope chest is a storage trunk that was used traditionally by an unmarried young woman to collect items such as clothing and household linen in anticipation of becoming married. 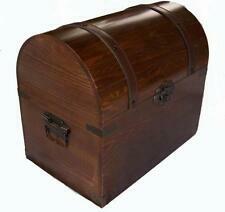 This type of wood or fabric storage trunk was also called a dowry, cedar, or trousseau. They are generally used as accent pieces of furniture in living areas or bedrooms for all types of storage or as tables. Some trunks have very ornate designs and even family symbols or crests on the sides that would indicate whose trunk it was. 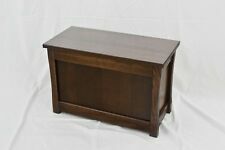 Blanket chest: A blanket chest or trunk is a sedentary type of storage trunk used as furniture for blankets or linen storage in a home. Many times, the trunk is ordained with sculpted wood on the bottom for beauty and is intended to be kept in living quarters so that extra covers are readily available for guests. This type of storage trunk will usually be rectangular in shape with a flat top, so it can also be used for seating. 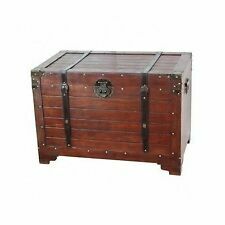 There are many different styles of these chests and trunks, such as antique, contemporary, traditional, or country. 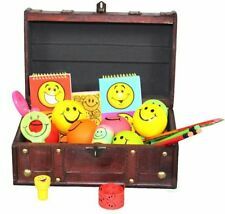 Storage trunk or chest: There is an even wider variety of storage trunks made of wood, metal, fabric, and even wicker. Storage trunks are used for storage of home items and valuables, to travel with, and they also work as bedside tables or coffee tables. Trunks are used as a multipurpose piece of furniture and double as storage for travel or camp necessities, such as supplies or clothing. They come in many different sizes and a variety of colours. Trunks are also used as footlockers and can come with or without wheels. 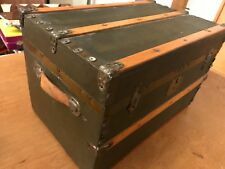 Footlocker trunks used as storage are normally thought of as being metal, but they can also be of wood with metal accents like brass or chrome. Footlockers and other storage chests can add an industrial, traditional, country, antique or nautical look to a room.